Former Higher and Tertiary Education, Science and Technology Development deputy minister Godfrey Gandawa (file photo). 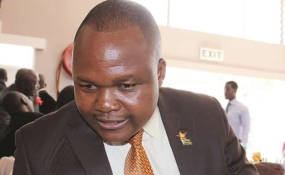 Former Higher and Tertiary Education, Science and Technology Development deputy minister Godfrey Gandawa was today issued with an arrest warrant after he failed to turn up for his corruption trial relating to the Zimbabwe Manpower Development Fund (Zimdef). Gandawa, who is facing 14 counts of fraud and criminal abuse of office, was expected to appear before High Court judge Justice Tawanda Chitapi for trial. His name was called three times to no avail. Prosecuting, Mr Clement Chimbari applied for Gandawa's arrest, prompting the judge to issue a non-bailable arrest warrant. Defence lawyer Mr Bernard Chidziva indicated to the judge that he last saw his client before the elections in July. Gandawa was indicted for trial at the High Court in April this year. He was arrested last year together with Nicholas Mapute, the Zimdef principal director of finance, for allegedly misappropriating over $400,000 in Zimdef funds. The arrests, which also affected then higher education minister Professor Jonathan Moyo, were carried out by the Zimbabwe Anti-Corruption Commission.